If you take the scale of J.R.R. Tolkien's "Lord of the Rings" trilogy and shrink it down to, say, rodent size, you end up with David Petersen's "Mouse Guard." Petersen's first six-issue story arc was a word-of-mouth success among discriminating comic book readers -- so much so that he won the Russ Manning Promising Newcomer Award at last year's Eisner Awards, which recognize top-notch talent, stories and books in the industry. 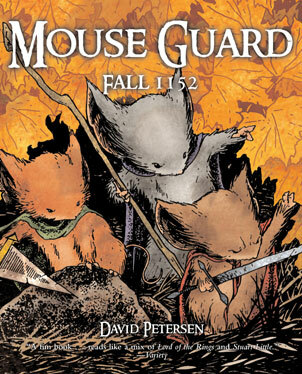 In fact, during this year's San Diego Comic-Con in late July, Petersen will be up for another Eisner, this time in the category of Best Publication for Kids for his first two "Mouse Guard" series, "Fall 1152" and "Winter 1152." While children have been part of the growing audience for "Mouse Guard" -- and Petersen's illustrations are fine enough to be found in only the best of children's books -- older fantasy fans can enjoy these adventures as well. The first story arc introduces readers to the mouse guard who defend their village kingdom of Barkstone, known for its artisans and "craftmice." After battling snakes and crabs during their search for a missing grain mouse, the guard come to find out that the now-dead mouse was a traitor and spy for a group of rebellious militia, who have in their possession a magic ax. Originally published by the independent Archaia Studios Press, which also did the hardcover collection of "Fall 1152," Petersen's series has recently been re-released in a softcover version -- with additional bonus material -- by Villard, an imprint of trade publisher giant Random House. Besides Petersen's stellar story and graphic work, the extras include a map of the mouse territories, descriptions of the towns, various trade work and a pinup and illustration gallery. The chance to reach a much larger readership outside of comic book enthusiasts took Petersen by surprise. "As unknown as Archaia was," said Petersen via e-mail from his Michigan home, "I think 'Mouse Guard' did a great job getting out there. (But) having the powerhouse of Villard on your side only helps to grow that audience in a big way." EVEN THOUGH the title is an anthropomorphic story, Petersen said he wanted "Mouse Guard" "to feel 'real' right from the start. ... If you don't believe that the mice could live the way they do, the whole thing falls flat on its face. Also, the characters need to seem real to the reader. If you think they are too fictional, you won't be invested (in them) when they encounter true danger. "(So) I started with my ideas of how mouse society would work. I did some research into the materials and methods of our own medieval societies, and tried to draw it as engagingly as I could. I was a huge fan of how Tolkien depicted a Hobbit's life in 'The Hobbit' and 'The Fellowship of the Ring.' That simple life of food and drink and rich, tilled earth and functional yet beautiful household items is something we all would like, so I figured mice would, too." And Petersen's work is certainly engaging. As he describes in his blog (at davidpetersen.blogspot.com), it's a meticulous and work-intensive process, going from script, sketches and layouts, penciling, inking, coloring (using Photoshop 7) and, finally, dialogue and sound effects. Petersen did, in fact, try to begin his career as a children's book illustrator after graduating from college, but, "unfortunately, I didn't hear back from all but one (and that one sent a 'no thank you' letter). So I started building a portfolio of better samples. I would draw and write children's books as gifts for my family. It was in this time frame, where I had just gotten enough of a portfolio together to start sending work out again, that 'Mouse Guard' hit." And, in an ironic twist, because of the success of his comic book, "I am doing a children's book with Harper Collins that is based on one of the gift books I gave to my wife. It's called 'Snowy Valentine's Day,' and it's going to be a fun one to draw and write." Besides the usual merchandise tie-ins -- statues and PVC and plush figures, plus a role-playing game in development -- Petersen said an animated movie of "Mouse Guard" could be in the offing, as he has partnered with producer David Kirschner, the man behind "An American Tail," "Cats Don't Dance" and, most recently, "Curious George." But first things first. Petersen is currently finishing up the "Winter 1152" series for Archaia. It follows up on the upheaval described in "Fall," where the mice of Barkstone have to deal with a food and medicine shortage, and our hero mice have an arduous journey back home. After that story arc is done, Petersen said he plans to take a short break "to regroup my thoughts for future 'Mouse Guard' stories, (but) I plan on getting as much 'Mouse Guard' out to the public as quickly as I can (over the next couple of years)."